Most Chickasaw now live in Oklahoma. The Chickasaw Nation in Oklahoma is the 13th largest federally recognized tribe in the United States. Its members are related to the Choctaw and share a common history with them. The Chickasaw are divided in two groups (moieties): the Impsaktea and the Intcutwalipa. They traditionally followed a system of matrilineal descent, in which children were considered to be part of the mother’s clan, whence they gained their status. Some property was controlled by women, and hereditary leadership in the tribe passed through the maternal line. The name Chickasaw, as noted by anthropologist John Swanton, belonged to a Chickasaw leader. 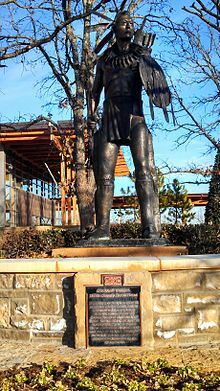 Chickasaw is the English spelling of Chikashsha (Muskogee pronunciation: [tʃikaʃːa]), meaning “rebel” or “comes from Chicsa”. 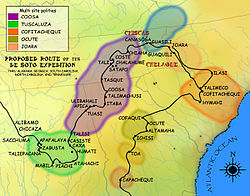 A documented prior source was when the Spanish explorer Hernando de Soto named them as “Chicaza” when De Soto’s expedition came into contact with them in 1540 as the first Europeans that explored the North American south east. 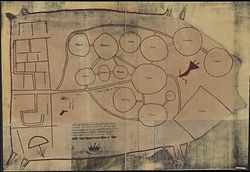 A c. 1724 English copy of a deerskin Catawba map of the tribes between Charleston (left) and Virginia (right) following the displacements of a century of disease and enslavement and the 1715–7 Yamasee War. The Chickasaw are labelled as “Chickisa”. Allied with the British, the Chickasaw were often at war with the French and the Choctaw in the 18th century, such as in the Battle of Ackia on May 26, 1736. Skirmishes continued until France ceded its claims to the region east of the Mississippi River after being defeated by the British in the Seven Years’ War (called the French and Indian War in North America). The 19th-century historian Horatio Cushman wrote, “Neither the Choctaws nor Chicksaws ever engaged in war against the American people, but always stood as their faithful allies.” Cushman believed the Chickasaw, along with the Choctaw, may have had origins in present-day Mexico and migrated north. That theory does not have consensus; archeological research, as noted above, has revealed the peoples had long histories in the Mississippi area and independently developed complex cultures. George Washington (first U.S. President) and Henry Knox (first U.S. Secretary of War) proposed the cultural transformation of Native Americans. Washington believed that Native Americans were equals, but that their society was inferior. He formulated a policy to encourage the “civilizing” process, and Thomas Jefferson continued it. The historian Robert Remini wrote, “They presumed that once the Indians adopted the practice of private property, built homes, farmed, educated their children, and embraced Christianity, these Native Americans would win acceptance from white Americans.” Washington’s six-point plan included impartial justice toward Indians; regulated buying of Indian lands; promotion of commerce; promotion of experiments to civilize or improve Indian society; presidential authority to give presents; and punishing those who violated Indian rights. 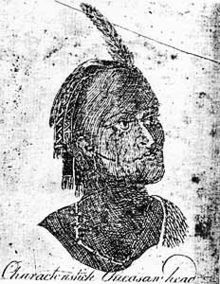 The government appointed Indian agents, such as Benjamin Hawkins, who became Superintendent of Indian Affairs for all the territory south of the Ohio River. He and other agents lived among the Indians to teach them, through example and instruction, how to live like whites. Hawkins married a Muscogee Creek woman and lived with her people for decades. In the 19th century, the Chickasaw increasingly adopted European-American practices, as they established schools, adopted yeoman farming practices, converted to Christianity, and built homes in styles like their European-American neighbors. 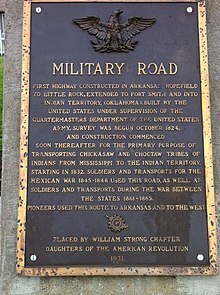 The Chickasaw signed the Treaty of Hopewell in 1786. Article 11 of that treaty states: “The hatchet shall be forever buried, and the peace given by the United States of America, and friendship re-established between the said States on the one part, and the Chickasaw nation on the other part, shall be universal, and the contracting parties shall use their utmost endeavors to maintain the peace given as aforesaid, and friendship re-established.” Benjamin Hawkins attended this signing. The Chickasaw had a matrilineal system, in which children were considered born into the mother’s clan; and they gained their status in the tribe from her family. Property and hereditary leadership passed through the maternal line, and the mother’s eldest brother was the main male mentor of the children, especially of boys. Because of the status of their mothers, for nearly a century, the Colbert-Chickasaw sons and their descendants provided critical leadership during the tribe’s greatest challenges. They had the advantage of growing up bilingual. Of these six sons, (named after James Logan’s father, ) served with General Andrew Jackson during the Creek Wars of 1813-14. He also had served during the Revolutionary wars and received a commission from President George Washington in 1786 along with his namesake grandfather. His brothers Levi (“Itawamba Mingo”) and George Colbert (“Tootesmastube”) also had military service in support of the United States. In addition, the two each served as interpreters and negotiators for chiefs of the tribe during the period of removal. Levi Colbert served as principal chief, which may have been a designation by the Americans, who did not understand the decentralized nature of the chiefs’ council, based on the tribe reaching broad consensus for major decisions. An example is that more than 40 chiefs from the Chickasaw Council, representing clans and villages, signed a letter in November 1832 by Levi Colbert to President Andrew Jackson, complaining about treaty negotiations with his appointee General John Coffee. After Levi’s death in 1834, the Chickasaw people were forced upon the Trail of Tears. His brother, George Colbert, reluctantly succeeded him as chief and principal negotiator, because he was bilingual and bicultural. George “Tootesmastube” Colbert never reached the Chickasaw’s “Oka Homa”; he died on Choctaw territory,Fort Towson, enroute. Then, there being- no other alternative by which to save their country and property, they, as the less of the two evils that confronted them, went with the Southern Confederacy. The Chickasaws were first combined with the Choctaw Nation and their area was called the Chickasaw District. Although originally the western boundary of the Choctaw Nation extended to the 100th meridian, virtually no Chickasaw lived west of the Cross Timbers. The area was subject to continual raiding by the Indians on the Southern Plains. The United States eventually leased the area between the 100th and 98th meridians for the use of the Plains tribes. The area was referred to as the “Leased District”. Because of their siding with the Confederacy, after the Civil War the United States government made a new peace treaty with the Chickasaw in 1866. It included the provision that they emancipate the slaves and provide those who wanted to stay in the Chickasaw Nation with full citizenship; they and their descendants became known as the . Descendants of the Freedmen continue to live in Oklahoma. Today, the Choctaw-Chickasaw Freedmen Association of Oklahoma represents their interests. The Chaloklowa Chickasaw Indian People were recognized as a “state-recognized group” by South Carolina in 2005. They are headquartered in Hemingway, South Carolina. In 2003, they unsuccessfully petitioned the US Department of the Interior Bureau of Indian Affairs to try to receive federal recognition as an Indian tribe. The suffix -mingo (Chickasaw: minko) is used to identify a chief. For example, Tishomingo was the name of a famous Chickasaw chief. The towns of Tishomingo in Mississippi and Oklahoma were named for him, as was Tishomingo County in Mississippi. South Carolina’s Black Mingo Creek was named after a colonial Chickasaw chief, who controlled the lands around it as a hunting ground. Sometimes the suffix is spelled minko, but this most often occurs in older literary references. ^ a b Chisholm, Hugh, ed. (1911). “Chickasaws” . Encyclopædia Britannica. 6 (11th ed.). Cambridge University Press. p. 130. ^ a b Cushman, Horatio (1899). “Choctaw, Chickasaw, and Natchez”. History of the Choctaw, Chickasaw and Natchez Indians. University of Oklahoma Press. pp. 18–19. ISBN 0-8061-3127-6. ^ a b Perdue, Theda (2003). “Chapter 2 “Both White and Red““. Mixed Blood Indians: Racial Construction in the Early South. University of Georgia Press. p. 51. ISBN 0-8203-2731-X. ^ Miller, Eric (1994). “Washington and the Northwest War, Part One”. George Washington And Indians. Eric Miller. Retrieved 2008-05-02. ^ Pate, James C. Encyclopedia of Oklahoma History and Culture. “Chickasaw.” Retrieved December 27, 2012. ^ a b c d Jesse Burt & Bob Ferguson (1973). “The Removal”. Indians of the Southeast: Then and Now. Abingdon Press, Nashville and New York. pp. 170–173. ISBN 0-687-18793-1. ^ a b Meserve, John Bartlett (December 1937). “Chronicles of Oklahoma, Volume 15, No. 4”. Oklahoma State/Kansas State. Archived from the original on 2008-05-18. Retrieved 2008-07-18. ^ Encyclopedia of Oklahoma History and Culture. “Choctaw”. Retrieved 2008-08-11. ^ Arrell Morgan Gibson (1981). “The Federal Government in Oklahoma”. Oklahoma: A History of Five Centuries. University of Oklahoma Press. p. 112. ISBN 978-0806117584. ^ Kappler, Charles (1904). “INDIAN AFFAIRS: LAWS AND TREATIES Vol. II, Treaties”. Government Printing Office. Retrieved 2008-07-02. ^ Kappler, Charles (1904). “INDIAN AFFAIRS: LAWS AND TREATIES Vol. II, Treaties”. Government Printing Office. Archived from the original on 2008-05-09. Retrieved 2008-07-02. ^ Kappler, Charles (1904). “INDIAN AFFAIRS: LAWS AND TREATIES Vol. II, Treaties”. Government Printing Office. Archived from the original on 2008-05-09. Retrieved 2008-05-02. ^ Kappler, Charles (1904). “INDIAN AFFAIRS: LAWS AND TREATIES Vol. II, Treaties”. Government Printing Office. Archived from the original on 2008-05-12. Retrieved 2008-07-02. ^ Kappler, Charles (1904). “INDIAN AFFAIRS: LAWS AND TREATIES Vol. II, Treaties”. Government Printing Office. Archived from the original on 2008-12-11. Retrieved 2008-07-02. ^ Kappler, Charles (1904). “INDIAN AFFAIRS: LAWS AND TREATIES Vol. II, Treaties”. Government Printing Office. Archived from the original on 2010-09-07. Retrieved 2011-03-27. ^ Kappler, Charles (1904). “INDIAN AFFAIRS: LAWS AND TREATIES Vol. II, Treaties”. Government Printing Office. Archived from the original on 2008-05-13. Retrieved 2008-07-15. ^ “South Carolina Indian Affairs Commission. Archived 2013-01-11 at the Wayback Machine Retrieved 19 September 2012. ^ “Receipt of Petitions for Federal Acknowledgment of Existence as an Indian Tribe.” Federal Register. Volume 68, Number 54. 20 March 2003. Retrieved 19 September 2012. ^ “Native American Data for Jay J Fox”. RootsWeb. Retrieved 10 June 2015. ^ “Carter, Charles David (1868–1929).” Oklahoma Historical Society’s Encyclopedia of Oklahoma History and Culture. Retrieved 6 May 2012. James F. Barnett, Jr., Mississippi’s American Indians. Jackson, MS: University Press of Mississippi, 2012. “Chickasaws: The Unconquerable People”, a brief history by Greg O’Brien, Ph.D.